Business Accounting Phoenix: When Should You Outsource Your Business Accounting? As a business owner in Phoenix, you’ve grown your company from one person to many. You’re the sole decision maker. The captain of the ship. But how long will you remain the bottleneck to every decision? How long can you sustain having a hand in every single process operation? At some point, you need to delegate. Not only for your own sanity, but also for your business growth potential. As a single person, you may be able to handle it all right now, but if you want to take your business to the next level, you need to leverage outsourcing. In this post, Limitless Investment & Capital is going to discuss when you should outsource your accounting obligations as a business owner and operator. It can be daunting to relinquish control, but you will gain more in time and money if you decide to leverage business accounting services. It’s inevitable that your business will grow. It’s on a trajectory to be bigger than you ever imagined. You can see it, but as the captain of your ship, you see the storm on the horizon. How will you handle it all on your own? The short answer is you do not have to. In fact, outsourcing your bookkeeping, accounting, and tax obligations to a certified public accountant and/or a tax professional allows you to focus on what you do best. Typically, a business owner is the visionary. Those who run businesses that are not visionary tend to find partners who are visionary. Nonetheless, your best asset is guiding the company toward success, fulfilling the mission you set in stone at the founding of your business. You can reduce costs by outsourcing your financial and accounting obligations. You need to hire new employees to handle the influx in financial and accounting responsibilities. You’re constantly making financial and accounting adjustments on the fly. There is more to business costs than money, even though it’s one of the primary metrics used in growth. When you outsource your financial and accounting obligations, you’re able to save money and time. This money and time can be leveraged to grow your business. When you keep financials and accounting in-house, you will need to hire employees to process the responsibilities. This requires an investment in time and money. When you outsource to a company that offers business accounting services in Phoenix, you pay a fraction of the cost for the same service you would have kept in-house. If you’re overwhelmed and too busy to make smart financial decisions, it’s time you consider outsourcing your financial and accounting responsibilities. A quick decision may seem like the best option now, but if you’re not completely aware of the financial status of your business, a single decision could sink your business — or at least make it bleed money fast enough to halt growth. 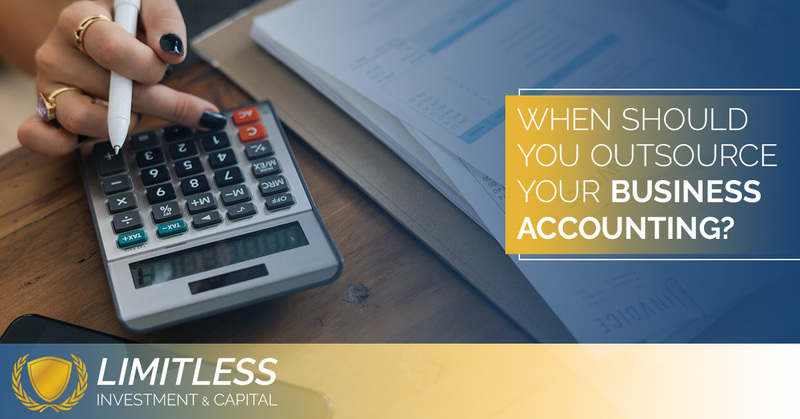 As your business accounting experts in Phoenix, Limitless Investment & Capital is ready to help take your business further. Contact us for a free consultation today!